Question: I have heartburn even when I have mildly spicy food and it does not get relieved with antacids like gelusil. What should I do? Answer: You may be suffering from GERD. Consult your doctor. General tips - Reduce weight if overweight. Eat small frequent meals. Stop tobacco and alcohol use. Use medications as per your doctor's prescription. Q: Sometimes after my meals when I burp, the food eaten comes up. Why does that happen? 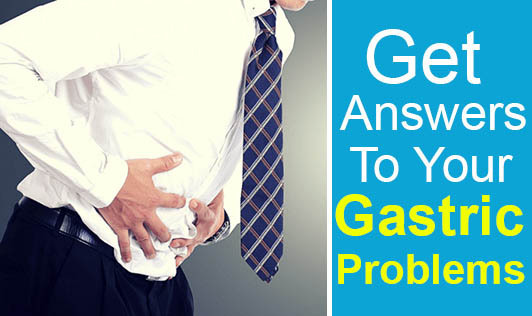 A: Because of reflux or regurgitation of food into the stomach since the stomach is full. This could be normal if it's not present in severe form. Q: After eating fried foods or oily foods, I feel sick and nauseated. Why? A: Oil is fat in liquid form. Oil and fat reduces stomach contractions and causes delay in stomach emptying. This can make you feel nauseated. Q: Elders say it is important to empty bowels early in the morning and it is not good to empty bowels immediately after having a meal. Is that so? Why is it considered bad for health to empty bowels at irregular times? A: It is only a myth. One can empty bowels at any time depending upon your convenience. It is not the time of bowel evacuation which tells your health status, but nature and consistency of the stool which decides whether you are healthy or not. Q: I make it a point to eat lot of fresh fruits and vegetables and also have a portion of raw salads every day. I still experience constipation very often. Why? A: Drink plenty of fluids also. If not better consult a doctor. Check any medications you are taking. Constipation can be a disease which may not respond to increase in fiber. Q: When my meals get delayed, my stomach becomes bloated? Why? I can hear some rumbling sounds too. A: It is a normal physiological process for stomach to grumble when hungry. It is called phase III MMC. Q: Is it good to have curds when experiencing heartburn or stomach burn? A: It is neither good nor bad. Heart burn may increase since curd is acidic. Q: Is it correct that stress at work causes heartburn and acidity? A: Yes to some extent, but not the sole culprit. Q: How many liters of water should I drink per day to relieve constipation? A: At least two liters. Q: What are the foods causing flatulence? Q: Why does my stomach pain at night always? A: May be ulcer or GERD. It is difficult to say without history, examination or investigation. Consult a doctor immediately if the pain is severe. Q: Is it good to have soda after having a heavy meal? A: No evidence to say it is bad or good. Q: What is the ideal time to have breakfast, lunch and dinner? A: Apply this logic - Do not keep stomach empty for long time. Do not eat soon after getting up since you may not feel hungry. Eat dinner at least 2 hours before you go to bed. Q: If one experiences continuous bloating or burping before or after meals, should that be considered as a symptom of a serious stomach ailment? A: It may not be serious. You may be suffering from Aerophagia and burping.